For many cameras Olympus stores Sensor Calibration information in their raw files as tags in the Exif MakerNote. In this article I'll compare those values with measurements from DxOMark for what DxOMark calls "Measured ISO". 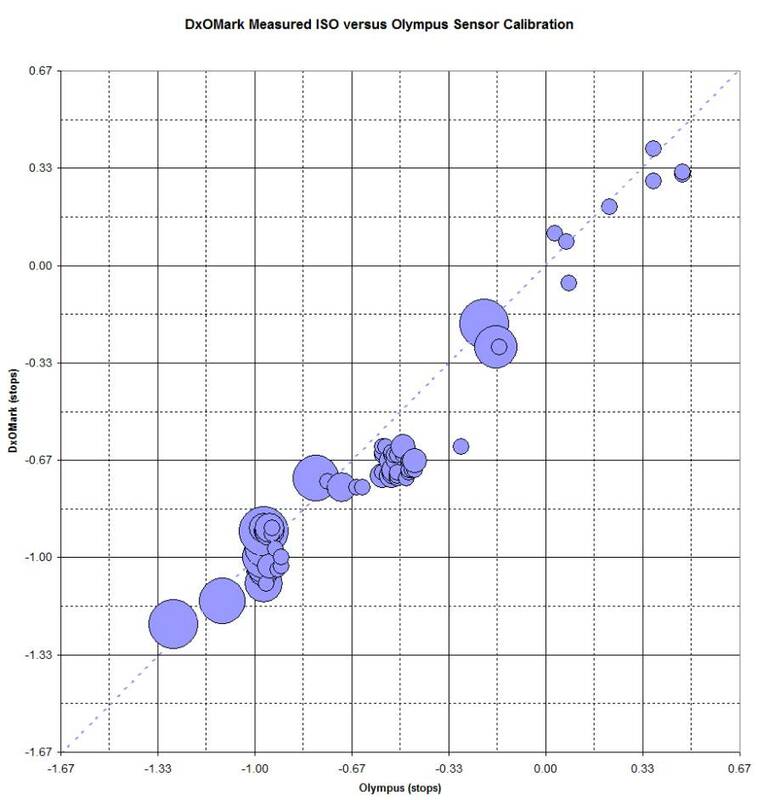 We can use a program like Exiftool to get Sensor Calibration information out of Olympus ORF files. I this article I'll only consider the 2nd Black Level 2 value which is for one of the green channels. In general the Black Level 2 values are identical or quite close across all four channels. For this camera and ISO setting the DxOMark value for Measured ISO is ISO 122. DxOMark appears to use L50 adjusted by 1/2 stop as their standard. L50 is 18.4187% (commonly rounded as simply 18%) so this works out to 13.0240% as their middle gray standard. DxOMark is log2(15.8892% / 13.0240%) @ 0.29 stops. The difference of 0.08 stops or about 1/12 stop is pretty good agreement. The only camera I had to omit was the Olympus XZ-1 due to invalid Olympus values (probably due to a firmware bug). Although the values are quite close there is a tendency for the DxOMark values to be slightly lower than the Olympus values. In particular there is a cluster of values at around -1/2 for Olympus and -2/3 for DxOMark. Here distance from perfect match is the distance from a data-point to the line formed by y = x (the dotted line in the bubble chart). Although this looks heavily skewed, the average value is only about 0.04 which is 1/25 of a stop. 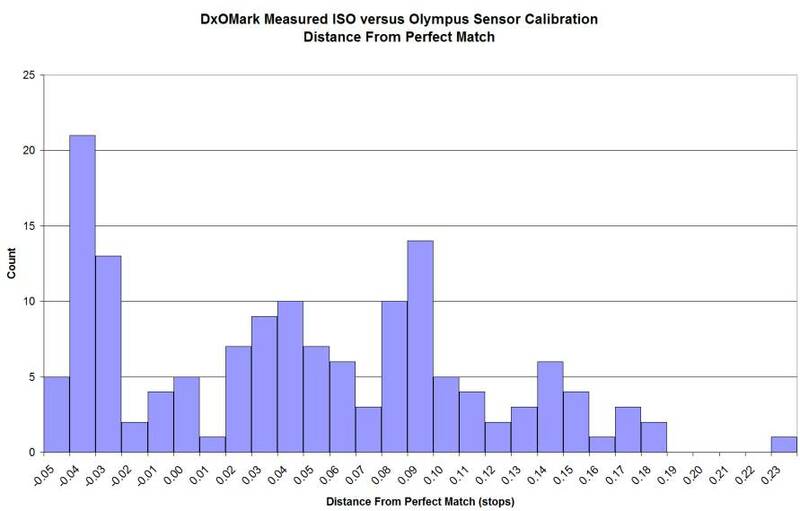 DxOMark Measured ISO and Olympus Sensor Calibration are in pretty close agreement. Assuming that we should treat the Olympus value as authoritative it appears that DxOMark has a slight tendency to report lower values. Furthermore we observe that in general Olympus Sensor Calibration is about 1/2 to 1 stop below L50 adjusted for 1/2 stop headroom. In other words Olympus provides 1/2 to 1 stop of highlight protection in exchange for a corresponding loss in the deep shadows. This doesn't affect dynamic range but could affect comparisons of low light performance with other camera brands depending on their sensor calibration.